When “The Karate Kid” arrived in theaters in 1984, screenwriter Robert Mark Kamen, director John Avildsen and producer Jerry Weintraub could not have predicted how deeply embedded in the pop-culture zeitgeist the low-budget summer movie aimed at teens would become. That anyone striking the crane kick pose or repeating the phrase, “Wax on, wax off” can elicit immediate recognition across generational lines is evidence that “The Karate Kid” continues to live on, more than 30 years later. But the movie about an underdog fish-out-of-water teen new to Southern California who learns karate from a Japanese American man in order to protect himself against a cadre of karate-trained thugs struck a chord with moviegoers that would spawn three sequels to the original, an animated TV cartoon and a 2010 remake, with a second installment to the revived franchise in the works. Although Avildsen hasn’t been involved with the franchise since the third installment, for Kamen and Weintraub, who died in 2015, “The Karate Kid” and its legacy has become the gift that keeps on giving. Much of the credit to that longevity can be attributed to the original’s lightning-in-a-bottle chemistry between the original film’s co-stars, Ralph Macchio and Pat Morita, who portrayed, respectively, the teenage Daniel LaRusso and much older Mr. Miyagi, the building supervisor at the low-rent Reseda, Calif., apartment complex where “Daniel-san” and his mother landed after a cross-country car trip from New Jersey. Morita, who died in 2005, brought unexpected soul and humanity to what otherwise might have been a throwaway, stereotyped role — and was rewarded with a best supporting actor nomination at the 1985 Academy Awards. On Nov. 15, producer Oscar Alvarez and director Kevin Derek of Love Project Films announced that they are working on a documentary about Morita’s life, based on an uncompleted memoir he was writing up until the time of his death. They have also launched a 35-daylong Indiegogo campaign to raise funds to help produce their documentary. 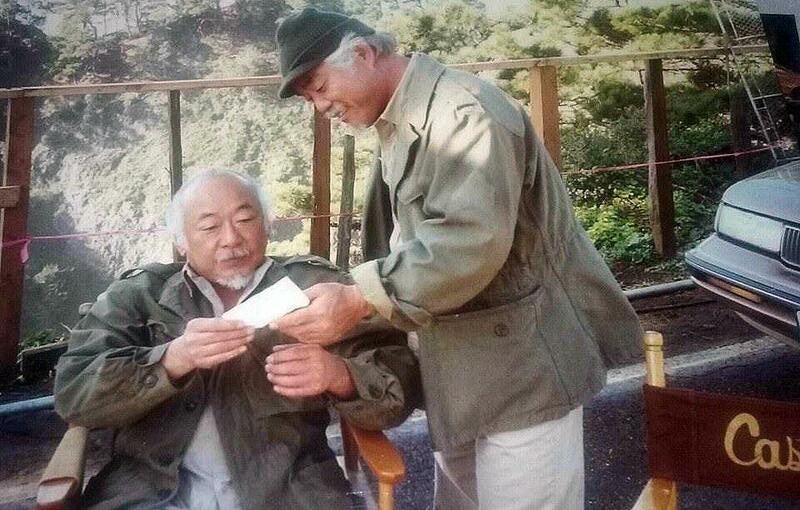 Pat Morita, left, confers with Fumio Demura, who served as his stunt double for the role of Mr. Miyagi in the “Karate Kid” movies. The duo previously worked on a documentary titled “The Real Miyagi,” which chronicled the life of Fumio Demura, a real-life master of karate from Japan. Demura was Morita’s stunt-double in the original “Karate Kid” movies — and would become pals with Morita. “The Real Miyagi” tells how Demura got to the point of being selected to be the man who did Mr. Miyagi’s actual karate moves after coming to the United States to teach karate and author several books about the martial art of karate to Westerners hungry for authentic knowledge. According to Alvarez, when he and Derek interviewed several subjects for “The Real Miyagi,” they met Morita’s third wife and widow, Evelyn Morita, who also appeared in the movie. Alvarez said that after the documentary was completed, Evelyn Morita revealed that she had in her possession a manuscript, her late husband’s memoir, which he had been working on for nine years prior to his death and that it might be a good basis for another documentary — this time about that other real Miyagi, Pat Morita himself. Alvarez, who says he “grew up with Pat Morita” via his movie and TV oeuvre, admires what Morita was able to accomplish, considering the hurdles he had to overcome. “A lot of people don’t know this, but prior to him becoming an actor, he worked in the aerospace industry,” Alvarez said as an example. After reading the manuscript, Alvarez realized that there was a compelling story about Morita that the general public does not know. But it’s always the first four “Karate Kid” movies for which Morita is best remembered. According to Alvarez, however, Morita’s memoir details aspects of his early years, including contracting spinal tuberculosis — which put him in a full body cast for much of his childhood — to being incarcerated with his family in two different War Relocation Authority camps. Later in life, he would walk away from an unsatisfying corporate job to pursue comedy, a path few Japanese Americans of his generation would tread. Using that as a jumping off point, Alvarez and Derek have begun interviewing several people who either worked directly with Morita or were touched by his influence. Derek, however, is very interested in making sure the documentary (working title “Pat Morita: Long Story Short”) conveys the part of Morita’s story before fame, fortune — and misfortune — came his way. In an email, Derek said, “His entire life was compelling. Can you imagine being in a full body cast from age 2-11 due to contracting a rare form of tuberculosis? Having been told that you will never walk again? And, when finally being treated and able to walk, the war breaks out and he’s escorted by an FBI agent to the internment camps. His family had to get rid of everything they had worked hard for and restart their life from scratch. “Pat had been married three times and has one daughter from the first marriage, two from the second and his last wife is the estate holder, and for some reason, there is tension between them,” said Derek. According to Derek, upon learning of the documentary, one of Morita’s daughters asked to see its outline and structure. Derek said he did so and let her know his team wanted to interview her and her family, but she responded that she needed to be included as a writer and producer in order to participate. “My response was very simple — there can only be one chef in the kitchen and that I would like an ongoing dialogue but do not want any side of the family influencing the direction of this doc,” said Derek. Included among those interviewed about their interactions with and impressions of Morita are comedian Tommy Chong, actors Esai Morales, Julia Nickson and Martin Kove (who memorably played the villainous Cobra Kai sensei in the original “Karate Kid”), as well as screenwriter Kamen. Notable for their absences thus far are, however, actors such as Tamlyn Tomita and Ralph Macchio or director Avildsen, which Derek and Alvarez say is due to the influence of one of Morita’s daughters, Aly Morita. In a conversation with the Pacific Citizen, however, Aly Morita denied urging any of the principals involved with the “Karate Kid” movies from participating with this documentary, and she issued the following statement via email: “My sisters and I are aware of a documentary being made right now about our father, but have declined to become involved. “As the current documentary being made stands now, we are not confident that it will be done with our father’s best interest in mind, but rather as a vehicle for my father’s third wife to tell her version of a very incomplete story. So, while the movie is underway in its current form, things could change between now and its completion. The filmmakers have said that they are forging on regardless, and if this new documentary is as successful in telling the story of Pat Morita’s life as their documentary about Fumio Demura was, then fans of the iconic funnyman will be in for one kick of a movie once it comes to fruition. To learn more about the campaign to raise funds for the Pat Morita documentary, visit https://www.indiegogo.com/projects/pat-morita-long-story-short-film/ and to learn more about this movie, visit http://www.PatMoritaTheMovie.com.